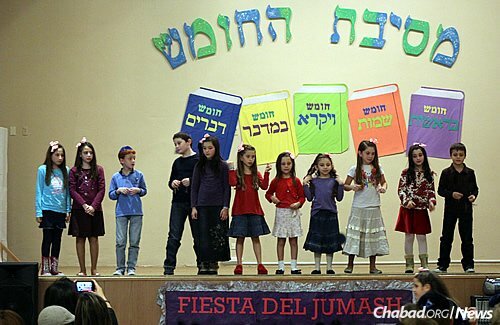 Students celebrate Torah study at Chabad’s Wolfsohn-Tabacinic School in the Belgrano neighborhood of Buenos Aires. While the school's general education has remained first-class, the Jewish studies have, by all accounts, greatly improved in recent decades. BUENOS AIRES, Argentina—A broad, barrel-chested man, Gabi Levinsky rose to address 150 fellow parents gathered in the cafeteria of the Wolfsohn-Tabacinic School. It was Friday night, and children ran freely around the room as Shabbat dinner stretched late into the muggy Argentine evening. 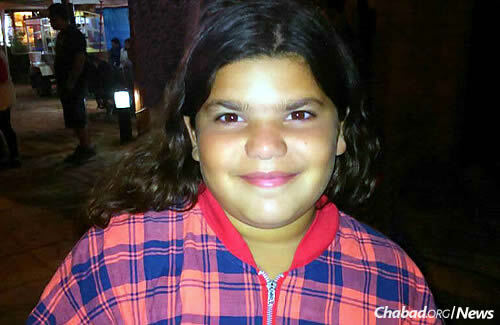 With tears in his eyes, Levinsky thanked the Wolfsohn community for standing with his family following the sudden passing of their daughter a year earlier. By the time his short speech was over, there wasn’t a dry eye in the room. Then tragedy struck. On Feb. 13, 2014, the Levinskys’ modest home experienced a gas leak. Most of the family—Gabi’s wife, Virginia; son Nico; and daughter Maggie—slept upstairs, but Julietta’s room was on the first floor, near the leak. Gabi managed to get to his eldest daughter and carry her out of the house, but by then, it was too late. Rabbi Mendy Gurevitch, director of the Wolfsohn-Tabacinic Jewish day school and community center, addresses parents, alumni and supporters at the institution's annual dinner. The loss of a child brings with it unimaginable pain for a parent, and although he had a roof over his head and food for his family, Gabi was depressed. He missed his daughter terribly, and nothing could change that. 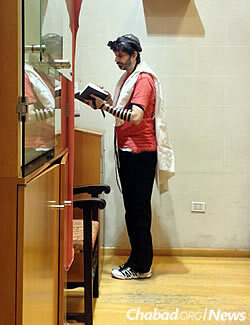 One evening a few days prior to the Shabbat dinner at which he spoke—as had occurred so many times over the course of the year—Gabi was in deep discussion with Gurevitch in the rabbi’s office. 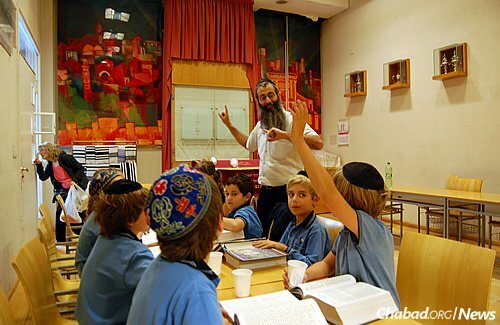 Wolfsohn's youth director Rabbi Gad Pichel runs after-school programs and extracurricular Jewish activities at the school. 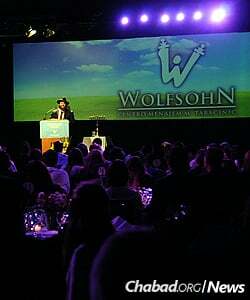 Wolfsohn was founded in 1906 as a Jewish community library before growing to encompass a school and synagogue. 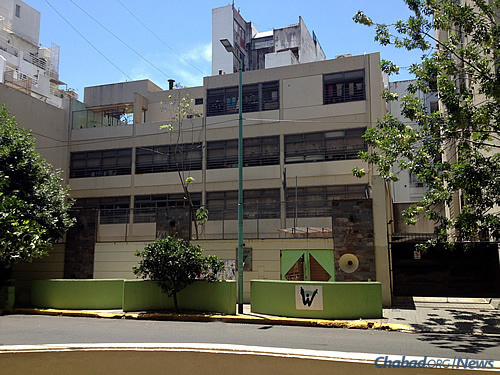 Wolfsohn—named after Zionist icon David Wolfson—served as the flagship school of the Conservative movement in Buenos Aires until 2004. Despite its long and proud history of academic excellence, the institution’s finances faltered in the 1990s, and following the Argentine economy’s severe crash in 1998, it was on the brink of collapse. Enrollment at the school had once topped 1,000, but the institution’s precarious finances left it with barely 150 students and heading towards imminent closure. 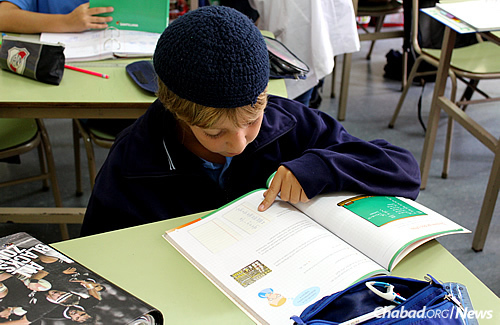 The school has developed into a full-fledged Jewish activity center, complete with a synagogue, classes and even entertainment. Diego Fainzaig’s experience was similar. 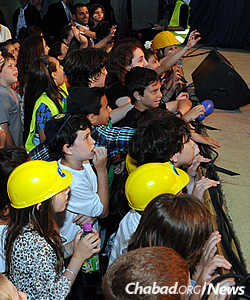 The Fainzaigs are a well-established philanthropic family in Buenos Aires, together generously donating to Chabad and other Jewish causes in the country. Well-aware of Grunblatt’s passion, Fainzaig nonetheless wasn’t expecting a call from him two weeks before the start of the school year, urging him and his wife to consider Wolfsohn-Tabacinic for their children. 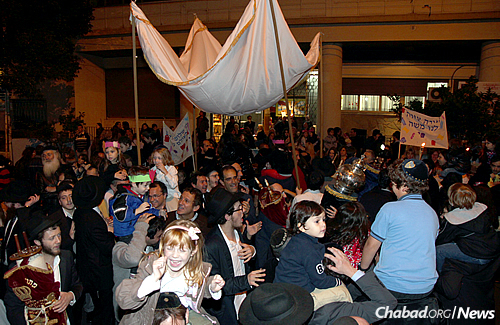 He and others credit Chabad with breaking down the barriers between what had always been considered the realm of the small, secluded Orthodox Jewish communities—Torah study and traditional observance—and the broader Jewish community of Buenos Aires. 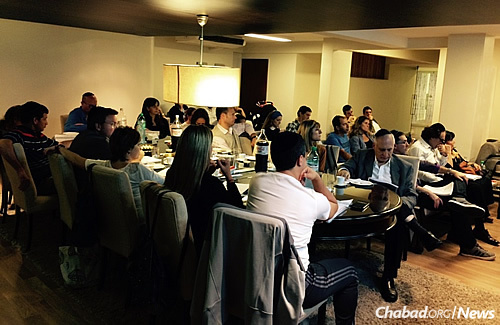 A Rohr Jewish Learning Institute (JLI) class given in newly renovated space at the Wolfsohn building. The classroom and library area was sponsored by the family of the late Argentine philanthropist Micki Rosenthal. 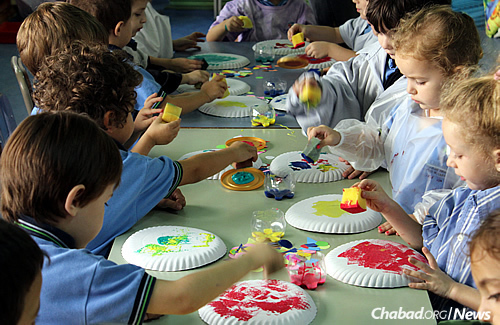 “During Shabbat lunch, I ask my children what they learned about the Torah portion that week. The youngest starts, the next one adds something, and we go around the table,” explains Fainzaig. “It makes me so happy to be able to see this from my children—to see that they know things about Judaism that I never learned at such a young age. Diego Fainzaig has four children currently enrolled at the school. His family is sponsoring the refurbishment of the main hall, which will be named Salon Jaia Waisburg de Fainzaig, after the family’s matriarch. Parents credit the Gurevitches for how well the community has meshed and grown in recent years. Two years ago, they were joined by Rabbi Gad Pichel as youth director, who is responsible for extracurricular children’s activities at Wolfsohn-Tabacinic—such as father-and-son Torah study, Shabbaton trips and afterschool programs. Shacharit morning prayers at Wolfsohn. 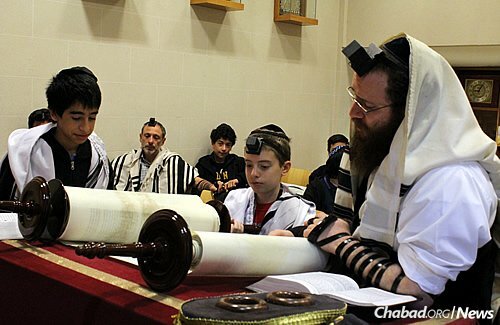 Gurevitch, right, reads from the Torah as a student receives an aliyah. 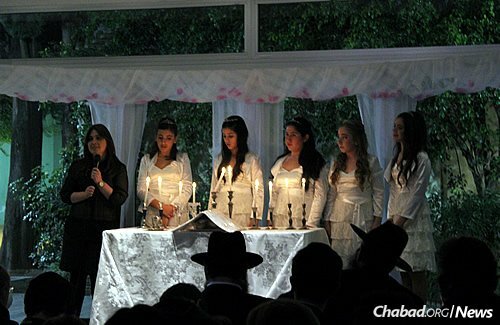 A bat mitzvah ceremony at the school, with the young women lighting symbolic Shabbat candles and receiving their own set of candle holders. At left is Wolfsohn's co-director, Lea Gurevitch. 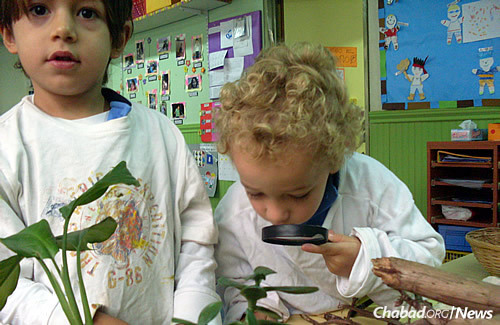 Students from across the spectrum of the Buenos Aires Jewish community attend the Chabad-run school. 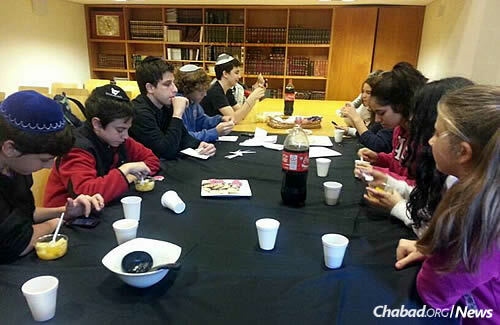 A teen club meets regularly at Wolfsohn, which plans on opening a high school in March 2016 to serve its elementary-school graduates.